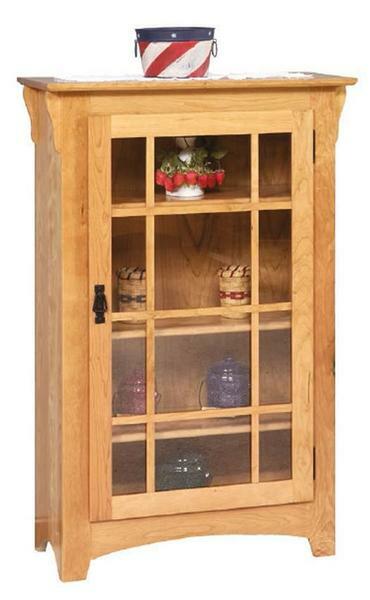 Handcrafted in the popular mission style, this attractive and functional bookcase makes a great display cabinet for your valuable collectibles with the mission style glass doors with wood mullions. Order yours today in the wood and finish of your choice. You won't be disapointed with the quality craftsmanship of this stunning solid wood bookcase. I can not tell you in words how much I love my new Dutch Crafters furniture pieces!! The quality, the workmanship is over the top. My sister and brother have both been to see it and rave about how stunning, and more importantly, how comfortable it is. I am 71 years old and have severe COPD as to where I am on oxygen 24/7. It really doesn’t stop me...just slows me down a tad. Three years ago I lost my Mother...she was 93 and still full of fun (and wine). She left her home to my sister, brother and myself. We kept it for a couple years before we decided to sell. In the meantime, my husband of 35 years, a Vietnam veteran and retired professional fire fighter, lost his battle to Leukemia. Five years before he passed away, we built a new one story home, a big change from our 5 bedroom Victorian). The furniture we brought to our new home was large and overwhelmed out new living room. But he liked it and so we kept it. There were two chairs that belonged to his parents, that are comfortable...and I had the cushions re-upholstered. After Kenneth passed away, seeing the couch he spent so much time on saddened me. I could not even bring myself to sit on it...it was his place. I finally came to the conclusion that I needed to get new furnishing for my living room...a tough decision to make. But being a widow, with only my retirement, finances were slim. Then we sold my Mothers house. My Mother was a WW2 Navy veteran, and it was sold to a female Navy veteran...it was meant to be. With the proceeds divided amongst my sister, brother and I, I now had the little ‘extra’ to make my wish for a new living room come true. When my sister came to see my new living room, she said to me, “Mom would have loved it!” I think my husband Kenneth would too. So thank you Dutch Crafters for creating such a wonderful dream come true. I even plan to have an ‘unveiling party’ for all my friends. I have attached pictures for you to see how wonderful it looks in my home...and you can also see how perfectly matches Kenneth’s family furniture that I will forever keep. Oh, something else you might want to know: My oldest daughter’s husband works for the Stickley Audi furniture company in Manlius, NY. She saw my furniture and she told me to put stickers with her name on it on the 3 stacking tables. And the delivery was wonderful. They had it all in and set up in about 45 minutes...on a blistering hot day.